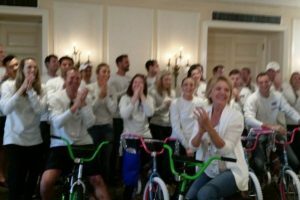 Avison Young’s emerging leaders (called “Young Guns”) met for a week of teambuilding and development. Char Fortune, Director of Learning and Professional Development, chose to start the week with a Build-A-Bike ® team activity in Toronto, Canada. The event started with a pun-filled memory game exploring leadership tips, especially customized for the Young Guns. Then the teams created flags with names like, “Dam Beavers, Southern Shotguns, and Char’s Stars.” For the cheer contest, each team performed twice – once for the judges and once for the camera crew on hand to document the teambuilding fun and philanthropy. There were many extra lights set up throughout the room to make the participants look great. We felt like we were in a Hollywood movie. The teams competed fiercely for bike pieces but soon cooperated to finish their bikes. Quinn Kelly manager at CAMH, the charity selected for this event, watched as six bikes were safety checked and readied. Laura Lewis-Barr facilitated this Build A Bike on September 21, 2016 in Salon A at the Fairmont Royal York Hotel, 100 Front St W, Toronto, ON M5J 1E3, Canada.